Apart from the major food principles like protein, carbohydrates, and fats, a large number of food items that we consume consists of indispensable components in them known as phytonutrients or plant-derived chemical substances. Although their contribution towards total calorific value ia insignificant, including these inert compounds in our diet in adequate quantities is imperative. The potential benefits in terms of their direct contribution to health promotion and disease prevention are really enormous. 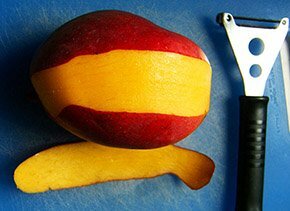 Mango peel with a fruit peeler. Changes in lifestyle and dietary patterns has resulted in new world illnesses like irritable bowel syndrome, coronary artery disease, diabetes, stroke, cancers, etc., in higher frequencies than ever before. Several types of research and experimental epidemiological studies have clearly suggested that the trends in these diseases patterns linked very closely to the diet we consume. 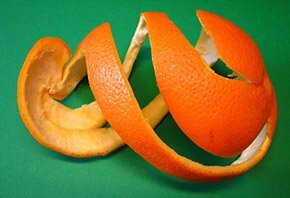 Consequently, new interest has risen in the medicinal properties of food items like herbs, spices, vegetables, and fruits along with their peels. Studies have found that certain chemicals other than nutritional principles in them have anti-mutagenic, free-radical scavenging, and immunity boosting functions, which help promote health and prevent diseases, apart from their nutritive value. Antioxidant vitamins like vitamin-A, E, and C in a large number of herbs, vegetables, and fruits. Plant sterols, also known as phytosterols, constitute mainly β-sitosterol. Beta-sitosterol is different differ from cholesterol, which is a sterol in humans, in many beneficial ways. Phytosterols absorb poorly in the gut, and during the process, they appear to block the absorption of dietary cholesterol as well; and thus help reduce serum LDL-cholesterol levels. Initial research studies suggest that experimental doses of plant sterols can be effective in countering the effects of testosterone-mediated hypertrophy in prostate glands (BPH). Again, they help minimize the risk of BPH and prostate cancer in men. Their effects in women, however, appears to be neutral or have some beneficial effect on breast, uterine and ovarian receptors. The other phytochemicals include detoxifying agents like indoles, isothiocyanates, non- starch polysaccharides (NSP) or dietary-fiber like gums, hemicellulose, mucilage, pectin, tannins,, and alkaloids like caffeine, theobromine, and non-protein amino acids. NSP, also commonly known as dietary fiber, increase bulk to the food and help prevent constipation problems by decreasing gastro-intestinal transit time. They also bind toxins in the food, prevent their absorption, and help protect the colon mucus membrane from cancers. In addition, dietary fibers bind to bile salts (produced from cholesterol) and decrease their re-absorption, thus help lower serum LDL-cholesterol levels in the blood. Phytonutrients play a crucial link between health and nutrition. A well-balanced food that is rich in phytonutrients such as fresh fruits, herbs, and vegetables can help minimize free radical and reactive oxygen species (ROS) mediated diseases. «Back to Food nutrition from Phytonutrients article. Food and Nutrition Information cente- National agricultural library, USDA. Stanford School of Medicine Cancer information Page- Nutrition to Reduce Cancer Risk. (Link opens in a new window). Antioxidants and Cancer prevention- National Cancer Institute.